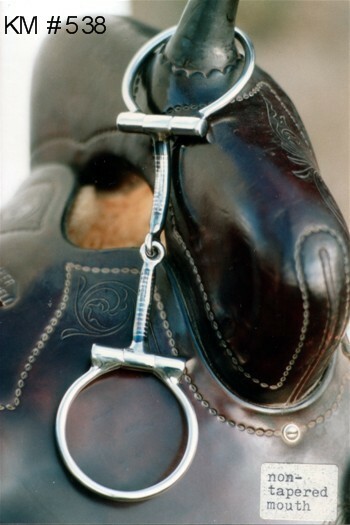 3/8" non-tapered snaffle mouth made as Classic Don Dodge style D/snaffle. Shown from side facing inside horses mouth, depicts 'Sweet Inlaid Mouthpiece' e.g. smooth copper striped blued section joined to stainless steel centre joints, end ferrules & D/rings. Only stainless shows to outside of horses mouth. photo KM # 538 copyright Ken Miller Bits & Spurs.